KAUAI, Hawaii, Jun 7 2012 (IPS) - Can a single species of tree significantly reduce hunger, unemployment and deforestation in the tropics? Researchers and scientists behind a surge in breadfruit activity think so. Over the last decade, a handful of nonprofits and NGOs have accelerated efforts to test, grow and distribute breadfruit trees with the idea that this versatile, nutritious, fast-growing member of the mulberry family has enormous untapped potential to improve food security and local ecosystems. Breadfruit proponents from Hawaii to British Columbia, the U.S. Midwest, Central America and Europe have stepped up efforts to expand the tree’s presence in the Caribbean. SOUTH PACIFIC: Food Crisis, An Opportunity For Change? Breadfruit, a staple in the Pacific Islands for thousands of years, has been popular in the Caribbean for over 200 years. What’s different about the trees being introduced today is that they are a Samoan variety called Ma’afala (mah-ah-fala), previously unknown in this part of the world. Ma’afala was selected as optimal for mass propagation and distribution because it has the highest protein and mineral nutrition (iron, potassium, zinc) of 94 varieties studied, and is widely considered one of the tastiest of varieties. 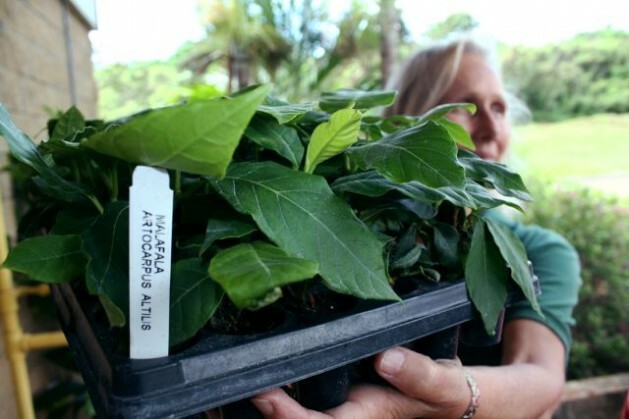 All the Ma’afala grown and distributed in the Caribbean today originates from the collection at the Breadfruit Institute, part of the Hawaii-based National Tropical Botanical Garden. Breadfruit Institute director Dr. Diane Ragone, who manages the world’s largest and most diverse breadfruit collection on Maui and Kauai islands, partners with Dr. Susan Murch, a chemistry professor at the University of British Columbia (UBC), Okanagan. Ragone began collecting breadfruit varieties for conservation and research in the mid-1980s and has worked with Murch to develop micro- propagation protocols for elite varieties that are then mass- propagated by U.S.-Germany-based Global Breadfruit. The tiny Ma’afala trees are then purchased by organisations which introduce the plants where they are most needed ― in places like Jamaica, Honduras and Haiti. One organisation encouraging the growth and consumption of Ma’afala is the Agro-forestry Regional Nursery (ARN) Foundation of Haiti. ARN works on the premise that local food security, employment and healthy watersheds and forests are interrelated. With the capacity to grow one million trees per year, the foundation aims to improve the condition of Haiti’s watersheds, nine out of 10 of which ARN co-founder James Kishlar says are polluted by humans and animals and the effects of deforestation. Including breadfruit as part of a suite of food-producing trees like mango, avocado, citrus and banana has environmental benefits while providing much-needed food and jobs. By adding Ma’afala to Haiti’s crop base, ARN aims to increase agricultural diversity and extend fruit-bearing periods since different varieties produce throughout the year. “Diversity is what we’re trying to get back to, not monoculture,” says Kishlar. Another nonprofit distributing Ma’afala is the Chicago-based Trees That Feed Foundation (TTFF) which is distributing breadfruit trees to school, hospitals, orphanages and for use in public spaces in Jamaica. TTFF works closely with the Jamaican Ministry of Agriculture, which receives the tiny trees upon arrival in the country and transports them to a nursery where they are grown out before being distributing to independent farmers who can receive up to 25 trees at no cost. In Haiti, TTFF has formed an alliance with a Port-au-Prince orphanage which is growing trees in a nursery until they are large enough to be given to partners. Since 2009, Trees That Feed has shipped over 12,000 Ma’afala trees, almost 3,000 to Haiti in this year alone. As more trees bear fruit, founder and chairperson Mary McLaughlin expects commercial farmers who can afford them to purchase trees and help increase interest and demand. But breadfruit, which is easy to grow and remarkably prolific – a single tree can easily yield 200 kg or more of food a year – has a short shelf life. Mature fruit must be consumed quickly and during fruit season there can be a glut. One way to address this is by drying and milling breadfruit for flour which is gluten-free and can be preserved for later use in secondary, value-added food products. The flour, which has a shelf-life measured in years, can be used for breads, cakes, porridges, and other baked goods, says Dr. Camille George, an associate professor at the University of St. Thomas’ (UST) School of Engineering. George is also a board member with Compatible Technology International (CTI), a Minnesota-based nonprofit that designs and distributes simple technologies that can be used to fight hunger in remote and rural communities. Trees That Feed has begun purchasing grinders and shredders designed by CTI and will help establish “factories in a box” that can be set up almost anywhere. By advancing interest in and use of breadfruit flour, McLaughlin says, there’s more need for harvesting breadfruit and growing more trees. She sees a bright future for breadfruit in the Caribbean. So does UBC’s Murch who thinks breadfruit is already beyond a tipping point. With the in-vitro Ma’afala breadfruit on the market and being circulated around the world (in 2011 one thousand Ma’afala saplings were hand-delivered to Ghana), the number of trees, the desirability of growing those trees, and a broader awareness of breadfruit as an under-utilised crop, not just in the Caribbean, but around the tropical world, is accelerating greatly. A second Samoan breadfruit variety – Ulu fiti – has already gone through virus screening and field testing protocols with memorandums of understanding established between interested parties. Next comes distribution and educating the public about the environmental, social, dietary and culinary benefits of growing, eating and selling breadfruit in its various forms. Greater interest and understanding of the trees, the Breadfruit Institute’s Ragone believes, means more breadfruit will be planted in the ground and filling the kitchens and markets throughout the tropical world and that, she says, can only be good.